(This is not) This Heat will play their final U.S. shows this year with appearances at LPR in New York on March 18 and the Big Ears festival in Knoxville, TN March 21-24. The final date for this reformed version of This Heat, comprised of original members Charles Bullen and Charles Hayward plus friends is in Deptford, London on Saturday, May 25th. The band timed their reformation (for a 2016 Japan gig) to the exact date in 1976 of their first gig 40 years previously. The group (name adjusted to acknowledge the passing of founding member Gareth Williams) seemed ready to re-enter a world teeming with chaos and confusion, just as they had left it. Having broken-up in '82/'83, with the sea change that Thatcherism and Reaganomics was bringing, it seemed appropriate that the band would reform on the cusp of Brexit and Trump's presidential election. Given the direct political nature of their stance, particularly on the second and final album Deceit, it seemed as if they were needed and that the band answered the call of duty. Speaking with Charles Hayward, drummer and guiding light about this band's re-emergence, was a revelation. The band really could not have returned at a more opportune moment as the world needed to be reminded of their vitriol and passion. Yet Hayward seemed inclined not to attach too much importance to their return. Whether explicitly through lyrics or implicitly through music, the band had rejected and challenged the nascent Neo-Conservative world-view of the time. The fragmented and experimental nature of their music as well as the feral nature of their recording process was a complete rejection of the Neo-Con world-view and all its power assumptions. In line with some of the other political post-punk acts of the time, ranging from the invention of The Pop Group to the fury of Gang of Four, This Heat were of their time and yet in terms of musical influence, somewhat in keeping with a '70's prog mind-set. Perhaps this is why they are so able to traverse the decades and sabotage the complacence of the times we find ourselves in. It's as if the intervening 33 years before they re-emerged was something of a dream, and they awoke from this dream as it turned into nightmare. However, when speaking to Hayward, all of this seemed to be further from his mind. Our London-New York, pre-Christmas Skype conversation had to be arranged to allow him to be home to receive packages, as he feared he would not be very popular with his immediate family otherwise. Throughout our conversation, he exuded the kind of decency and common sense that seems in short supply these days as we talked more about the practical aspects of performance rather than overt politics. And so, rather than discuss Brexit or the reemergence of Nationalism in Europe, Hayward was keen to discuss his musical technique. Much of his collaborative and improv work involves not only the drum kit but also three pre-recorded music tracks that are controlled without the use of a click/rhythm track. Hayward controls these with foot pedals to build layers of sound by introducing these sonic/looping elements with his own sense of rhythm and structure. He brings these elements in and out of play on the beat without prompting from the click track that many musicians rely on. Therefore, he is free to be completely spontaneous in their use and this allows for an organic interaction not only with the other musicians on stage but also with the audience. In fact, he describes the perfect improv collaboration as when both the musicians and the audience spontaneously realize the piece has reached its conclusion and both have anticipated and participated in its end. This "Zen Funk" is what he is striving for either as a member of the Monkey Puzzle Trio, V4V (and TINTH) or in collaboration with a solo artists like Manuel Troller or Thurston Moore. Surprising for such a skilled percussionist, Hayward's own compositions start on the piano. He credits the presence of a family heirloom piano throughout his upbringing with his reliance on it. With basic ideas and "songs" worked out on it, he then stripes away layers from them and adds elements in conjunction with the other artists that he works with. Hayward has been a vital and creative musician for over four decades now, starting in the mid-'70's with the excellent Quiet Sun Mainstream album from '75 featuring Roxy Music gutiarist Phil Manzanera. Interestingly, the Hayward composition "Rongwrong" from that album is featured on 801 Live (from'76) recording with Brian Eno and Manzanara among others. 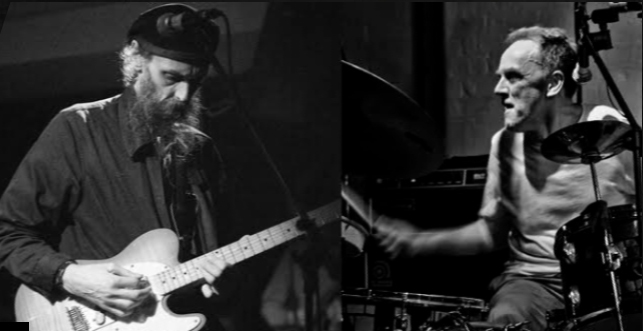 More interesting is that fact that Hayward was inspired by the punk upheaval in London to work with non-musician Gareth Williams (and Bullen) to record abstract jams in a disused meat locker that formed the basis of This Heat's recordings. Adding to the Can and Faust-inspired matrix were elements of Dub, World Music and tape loop experimentation that created this nearly uncatorgizable stew. Sometimes compared to Miles Davis On the Corner in its originality, the music produced in that meat locker is described by most people as something you just have to listen to closely as words fail to adequately capture its essence. John Peel famously stated when asked by listeners to play "more music like This Heat, that it would not be possible as nobody sounds quite like them," which is surely the best endorsement that a band can receive. In fact, looking at Charles' recent workload is to see a musician working with the same references as any jazz or free-form thinker. His schedule is peppered with ongoing colorations as well as one- of-a-kind, never to be repeated performances. He claims that he, as Derek Bailey asserts, "...would play with anyone once," and is concerned with the here-and-now rather than the past. Indeed, Hayward rarely seems to stop collaborating and moving forward. He was a member of Massacre with Fred Frith and Bill Laswell, a trio that BBC describes as an "unholy union of the Shadows, Capt. Beefheart, Bailey and Funkadelic" for a decade. Nice work, if you can get it. Perhaps this is one of the reasons that make the brief return of TINTH so vital. At their show last summer at Pioneer Works in Red Hook, Brooklyn, the band fired on all cylinders with the intensity of musicians one-third the age of the two original members. That line up featured James Sedwards, Frank Byng, Alex Ward and Daniel O'Sullivan and played an almost chronological set from both of This Heat's original albums (the '79 self-titled album and '81's Deceit). The last three years have seen a shifting group of musicians perform with Thurston Moore and Hot Chip's Alexis Taylor joining on occasion. Sadly, while there are many YouTube clips available of other TINTH performances, there are none of the amazing show in Brooklyn . On a warm summer evening in a former Iron Works factory dating from 1881 with views of the Statue of Liberty, the band delivered an astounding set that completely justified their reputation. After shows at the Pitchfork Festival in Chicago and Philadelphia, the band souned in excellent shape and we can only hope that the upcoming shows will share a similar intensity.